Designed by John Siddle in 1995. Published by FontFont. FF Boomshanker supports up to 50 different languages such as Spanish, English, Portuguese, German, French, Italian, Dutch, Swedish, Finnish, Danish, Irish, Basque, Icelandic, and Luxembourgian in Latin and other scripts. Nichts haben das Fernsehen und der Computer weggenommen von der Kraft und der Bedeutung des geschriebenen Wortes. 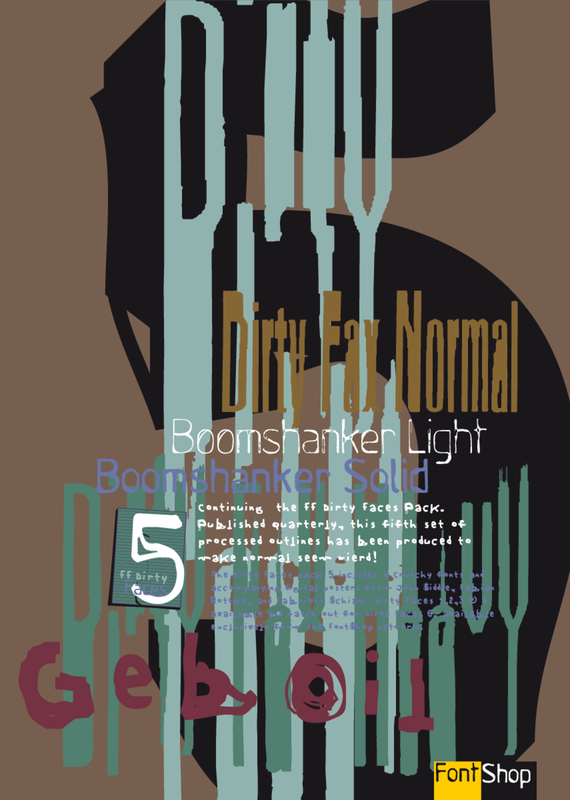 The “FF Dirty Faces 5” package is a collection of six grunge fonts from the 1990s, the fifth of a series of “destructive” font compilations published by FontFont. The advent of the FF Dirty Faces series launched a whole new trend in type design and inspired many others to begin creating or publishing their own lines of “dirty” typefaces. 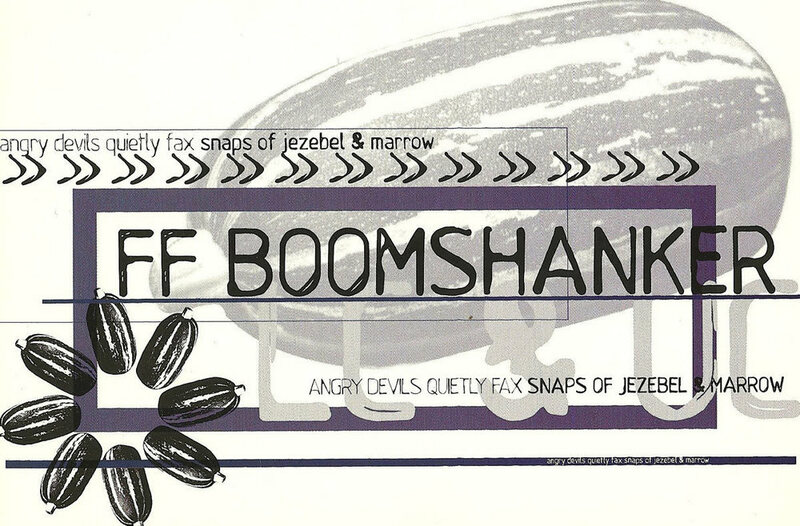 Siddle studied Visual Communication at Middlesex University, and it was there that he designed FF Boomshanker. An assignment required that he choose his favourite typeface, and make a poster about it. Siddle found that this just bored him to death. So he decided not to be a sheep, and to create his own font, much to the tutor’s disapproval. Thank god for Rotring stencils! The basis for Fabian Rottke’s FF Dirtyfax fonts (Regular und Heavy) was a Xerox 7010 Photocopier, using high sensitive thermo-paper. The fonts look like they got jammed in a fax machine during transmission, and were distorted almost beyond recognition. Both FF Geäb Oil and FF Mode 01, created by designer Fabrizio Schiavi, found their origins in music: “The assonance in the drawing of FF Geäb Oil matches the assonance of grunge music.” On the other hand, FF Mode 01 had the music of Depeche Mode as its starting point of. FF Mode 01’s symbols cannot tell the reader anything specific, but the user’s eye will still perceive sensations – just like the ear captures sensations from a song without words. The other characters in the typeface are often indefinable objects; they were chosen for their sonic weight, for the presence of black in the letter, and for the shape of the object drawn. Every character in FF Mode 01 appears like a bass note that you can isolate from the entire sound context.